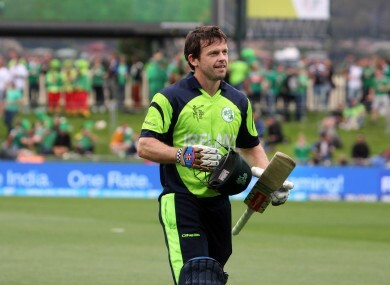 Tim Murtagh and Ed Joyce are calling it quits. Joyce represented Ireland at both the 2012 and 2014 Twenty20 World Cups in Sri Lanka and Bangladesh. ED JOYCE AND Tim Murtagh have retired from T20 International cricket with immediate effect, Cricket Ireland announced today. “I feel now is the right time to concentrate on the two longer formats of the game for Ireland,” Joyce said, following the announcement. “With potentially more ODIs in the next few years and the possibility of Test cricket in the near future as well, I feel like I’d be able to contribute more in these formats if I stop playing 20/20,” the 36-year-old Bray native explained. In addition, 33-year-old Murtagh gave similar reasons for calling it quits. “I haven’t played much T20 cricket for Middlesex recently. There’s such a busy schedule these days, and with a lot of cricket coming up for Ireland and Middlesex, I’m now maybe at an age as a bowler where some formats of the game are having to take priority. Chairman of Selectors Alan Lewis paid tribute to both players saying: “It came as no surprise that Ed and Tim have announced their retirements from T20 international cricket. “Both players are the wrong side of 30 ,but the heartening piece for us is their total commitment to the longer formats and ultimately our desire to play Test cricket in the future. “Wise men make the right decisions at the right time and this is no different. I can’t speak highly enough of both. Meanwhile, Ireland will announce their squads for the T20I series against Scotland and the ICC World Twenty20 Qualifiers this Friday. Email “Two Irish cricketers have retired from T20 internationals”. Feedback on “Two Irish cricketers have retired from T20 internationals”.